Saracen Interiors has completed refurbishment work for global leader in the design and manufacture of metal detection, checkweighing and X-ray inspection systems, Loma Systems at its UK headquarters in Farnborough, Hampshire. The national workplace consultant is expected to manage any further maintenance work for Loma using its knowledge of the building, derived from the work it has carried out to-date. 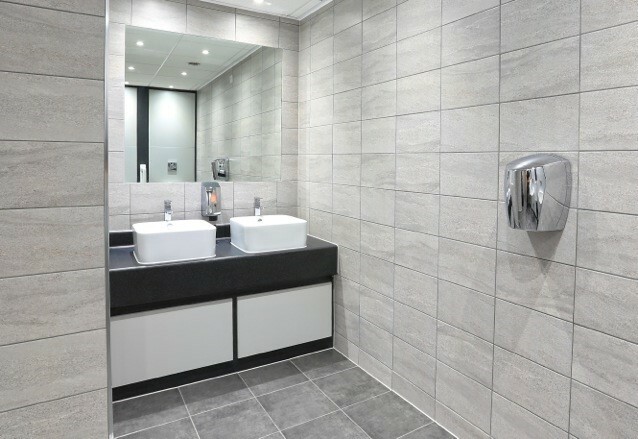 The refurbishment project covered the installation of new toilets on all floors, including disabled facilities, two shower cubicles, new lighting and security systems and work to the exterior of the building comprising of the installation of new safety barriers, signage, lamp posts and CCTV. Joint managing director of Saracen Interiors, Michael Page is delighted to continue the working relationship with Loma: “We sell ourselves on our broad understanding of workplaces, from building design to housekeeping, and we are now taking on a bigger, all encompassing role with the majority of our clients as they recognise the validity in using us to both support and supplement the job of the facilities manager, taking responsibility for the care and upkeep of any given building. Saracen tailors its facilities management packages, through its dedicated FM division, to suit each individual customer. Its extensive care and management services cover air conditioning, ventilation, heating, fire safety, maintenance, repair, plumbing, security and cleaning.